To start, combine the breadcrumbs, sesame seeds and chilli flakes in to 1 bowl and the rice wine vinegar, soy sauce and kecap manis in to another. Optionally, you can add chilli flakes in to the breadcrumbs for some extra heat. Dip chicken breasts in to the soy vinegar mixture let them marinate for at least 15 minutes. When the chicken has marinated, dredge them in the breadcrumb mixture; ensuring that each piece is well coated. Set aside the remaining soy vinegar mixture to be used later. In large saucepan of water, boil the soba noodles according to the packet instructions. Nearing the end of boiling the soba noodles, add the julienned carrots and cut snow peas to blanch them. Over a medium to low heat, pour enough vegetable oil to shallow fry the chicken. Cook the chicken until the crust has browned and the chicken has cooked through. Try to ensure that the heat is lowered if the crust begins to cook too fast. Transfer the cooked chicken on to a plate with a paper towel to absorb the excess oil. Let rest for 10 minutes before slicing in to thin pieces. 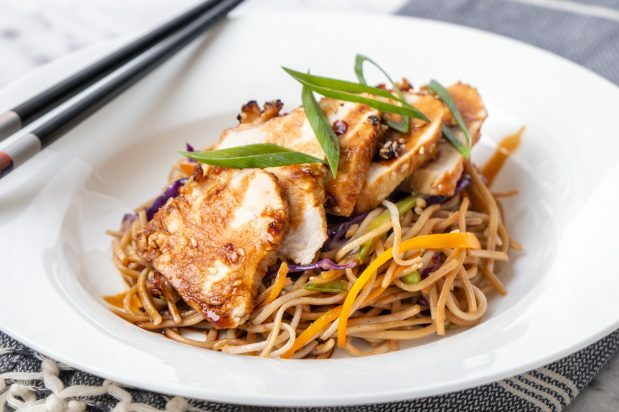 To plate the dish, place some of the soba noodles on to the plate and top with the chicken slices and the green part of the spring onions. Drizzle with the extra sauce and serve!